Mahindra South Africa is celebrating the surge in vehicle sales following its recent brand re-positioning and marketing campaign with the launch of the Mahindra S10 Karoo Edition. “The Mahindra Pik Up S10 Karoo Edition is an encore to the special S6 Karoo Edition, which was launched in December last year and which sold out very quickly. With the higher S10 specification level, this model is sure to sell out as fast,” says Rajesh Gupta, CEO of Mahindra South Africa. The reimagined Mahindra Pik Up Karoo Edition will launch with the S10 Pik Up specification level, which means that it will include satellite navigation, cruise control and a multi-function steering wheel, before the addition of the Karoo trim. In the Karoo S10 Limited Edition, Mahindra has added a special black cosmetic package, which includes blacked out off-road alloy wheels, a dark nudge bar and a dark branded roll bar.Mahindra also added a tonneau cover, flared rear wheel arches that complement the front arches, and a wind deflector kit on both the front and rear windows. 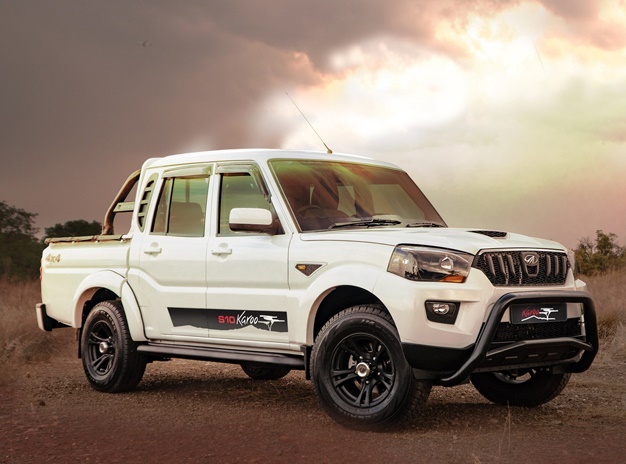 The special edition is available in either white or silver.For this special S10 edition, Mahindra will give buyers the option of the Karoo Edition cosmetic package or a colour coded canopy. This means that buyers can opt for the S10 Karoo Edition or an S10 with a white or silver colour coded Beekman luxury canopy, for the same price. “The special Karoo Edition of our S10 Pik Up will be available in limited numbers and will be immediately identifiable thanks to a larger decal set that stretches from edge to edge between the wheel arches,” says Gupta. The Karoo Edition gets its name from the tongue-in-cheek brand campaign and accompanying TV advertisement in which an intrepid adventurer moves heaven and earth to find a lost lamb. The campaign was conceptualised and filmed in South Africa by Mahindra and its advertising agency, Joe Public. Mahindra has confirmed that the first batch of S10 Karoo Edition Pik Ups have been completely taken up by dealers and that it will assemble a second consignment at its new assembly facility in Durban, KwaZulu-Natal. “While we want to keep the numbers limited to add to the Karoo Edition’s appeal, we have listened to our dealers who report that the initial demand far outstrips supply. “One of the secrets to the S10 Karoo Edition’s appeal is its price, which is a mere R5 000 more than the standard S10 model. This means buyers can opt for the 4×2 Double Cab Pik Up Karoo Edition for R337 999 or the 4×4 version for R368 999. “Both models are sold with a 4-year or 120 000km warranty and a 5-year or 90 000km service plan.”Even with the additional specifications, the S10 Pik Up Karoo Edition is still one of the most affordable quality double cab bakkies on the market. And with our South African plant now fully operational, we can ensure that every Pik Up is perfectly suited to local market needs,” says Gupta. Mahindra officially opened its assembly facility in May 2018 and has since produced the entire range of Pik Up models locally. While it has reached full production capacity for the first phase of the facility, it has the capacity to offer unique and custom models for South African bakkie enthusiasts.